When people usually think of kitchens and words to describe them the most common adjectives would be “Practical. Functional. Full of storage. Cooking zone.” Things along that line. But what if we also included descriptive words like “Decorative. Fashionable. Eclectic. Glam.” into the mix? Does something like this even exist? Well, in the home of blogger Christine Dovey, it sure does! 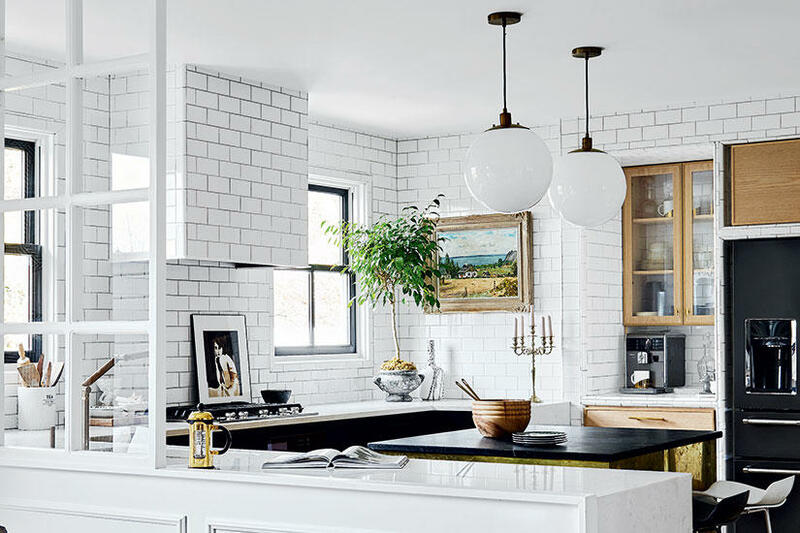 Her black & white glam kitchen, fused with just the right amount of gold is filled with all of the above, and stopped me in my tracks as soon as I saw it! What drew me first to the images I spotted in a recent issue of Style at Home was the layout of the kitchen. The U-shape of the cabinetry with the addition of an island made me wonder if I could do something similar if I ever opened up the wall between our kitchen and dining room (more on that another time!). 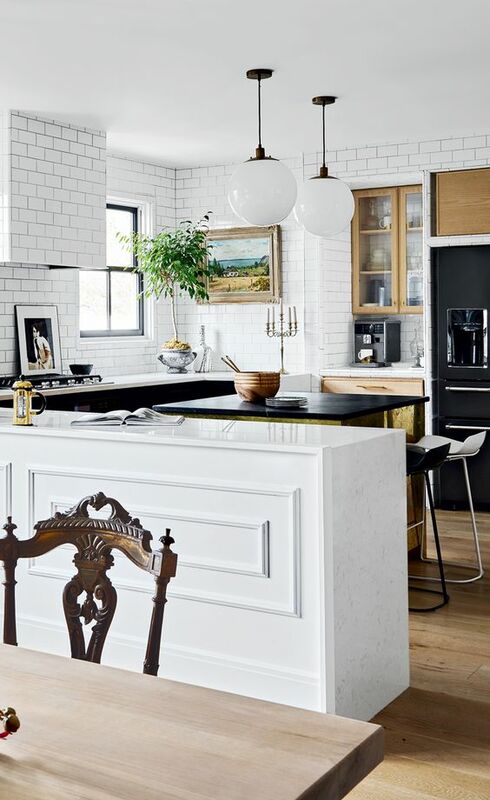 I loved the mix of traditional elements with modern, clean lines; the black “china” cabinets made my heart pitter patter, and the touches of gold added just the right hit of warmth for this high contrast black and white glam kitchen. Take a look! 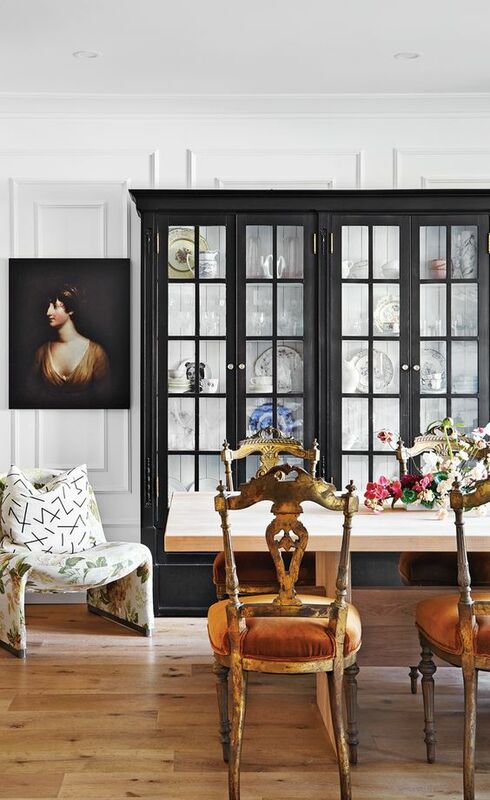 Classic color combo with black and white—the two tone cabinetry works so well in this space! The waterfall counter edge (where the counter “spills” onto the side of the cabinetry to the floor) separates the black door fronts from the white paneled side of the peninsula in a stylish way. Black appliances that actually look GOOD! …and that’s just picture one! Love, love love the black china-esque cabinet. It just pops against that gorgeous applied molding and is graphic, clean, and traditional all at the same time! …and so much storage too! The floral side chair is unexpected and makes the room feel far less “serious” and everything else look even more fabulous! In this last view into the kitchen from the hall you glimpse even more goodness packed into this dazzling kitchen! Brass on the sides of the island—a creative use of this material that is practical too (no stains, easy to wipe clean)! 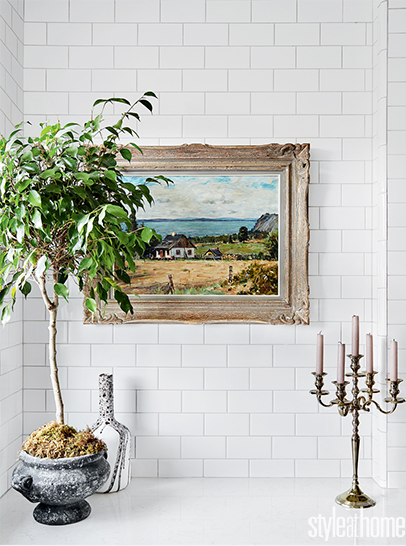 The ironwork inset in the archway—what a genius way to add character by incorporating architectural salvage in a very unique way! For many, this black, white and gold space would just have too much glam in a what is traditionally thought of as a work-zone room. But stop and think…why can’t a space that you peel potatoes in or bake birthday cakes in or have countless conversation in ALSO be a space that you find beauty in, portray your stylish side in, or appreciate art in? Maybe what you see here is difficult for you to envision in your own space, but let it inspire you to hide some of the everyday clutter and add in decorative touches that make you smile, flow with the décor of your home, and add sparkle in a way that isn’t crystal…and still be functional! Even if your kitchen is tiny. 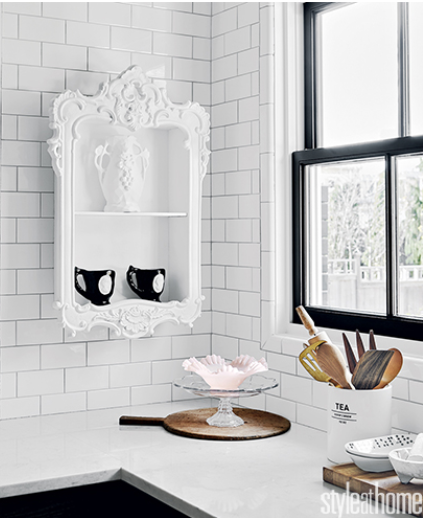 So, re-think your space and maybe, just maybe a glam kitchen might be just the look you are after! Not sure how to pull off a look like this in your own space? Well, we would love to help you out with that! Whether it is a one-time consultation or a complete re-design Bella Casa Interiors can provide plenty of ideas and experience to make your dream kitchen a reality. Check out a recent kitchen reno & see what we can do for you! Great design doesn’t just look good, it has to function and be a reflection of you, the homeowner, and your lifestyle.